Across Scotland, far too many young people cannot continue Gaelic Medium Education beyond primary school. This lack of opportunity has a negative impact on their fluency and confidence in using Gaelic. Arthur Cormack considers the position in Skye. A highlight of 2018, for me, was the opening of Bun-sgoil Ghàidhlig Phort Rìgh (the Gaelic-medium primary school in Portree on Skye – referred to as BSGP) – a natural step in the further development of Gaelic education in Skye. As we enter 2019 – the UN International Year of Indigenous Languages – Comann nam Pàrant Port Rìgh (CnPP) hosted a cèilidh this Friday (11th January) at BSGP to celebrate the Old New Year. Prior to it, Professor Antonella Sorace of Bilingualism Matters spoke on the many benefits of bilingualism and bilingual education, of which Gaelic medium education (GME) is the leading example in Scotland. Everyone was welcome. Comann nam Pàrant Port Rìgh worked for a decade to ensure the establishment of a Gaelic primary school in Portree and is now turning its attention to the heightened expectations of parents with regard to secondary provision. At present, about a third of Portree High School (PHS) pupils come from Gaelic medium (GM) primary education. The school has been a trailblazer in secondary provision, for many years offering a range of subjects through the medium of Gaelic not replicated elsewhere. PHS has a cohort of experienced GM subject teachers who demonstrate tremendous goodwill and skill. However, the provision is fragile with absences and retirals potentially leading to interruptions, or reductions, in GM subjects. With the likelihood of a future increase in the proportion of GM pupils entering PHS, development is needed to ensure the 3-18 GM provision proposed by The Highland Council (THC) is realised. Across Scotland, far too many young people cannot continue Gaelic Medium Education beyond primary school. This lack of opportunity has a negative impact on their fluency and confidence in using Gaelic. While some council members view this as a national problem requiring a national solution, I believe they should take a leadership role in contributing to its resolution. 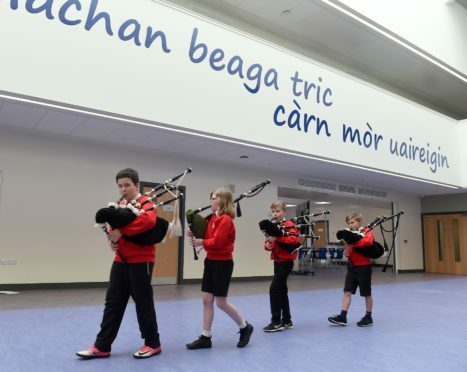 Highland Council has proposed some commitments relating to secondary Gaelic Medium Education in its latest Gaelic Language Plan. When he visited Skye to open BSGP, the Deputy First Minister acknowledged much still needed to be done to develop Gaelic Medium at secondary level. He hosted a summit in August where there was broad consensus regarding key themes relating to Gaelic education developments including progression in secondary, especially in the senior phase. With Statutory Guidance on Gaelic Education setting out out the circumstances in which secondary GM provision should exist, and proposals for development of GM provision in the National Gaelic Language Plan 2018-23, there is no shortage of policy or good intentions. There would be no better place than Portree High School to establish a secondary GM hub of excellence, recently proposed by CnPP, ensuring as much as possible of the curriculum is available through the medium of Gaelic in the school, and beyond, as well as encouraging and enabling the use of Gaelic in all school operations and activities. The hub could offer creative solutions to some of the barriers to expansion of GME in the senior phase of the school. These include lack of adequate time for teachers to prepare lessons and lack of support to enable teachers to produce resources and enhance their own language skills giving them confidence in using the Gaelic terminology connected with their subject. There is also a need for additional human resources to ensure GM teachers are freed from teaching in English to enable them to deliver their subject in Gaelic in the senior phase. As well as providing an enhanced GM curriculum for Portree High School pupils, a hub could offer valuable training and mentoring opportunities for student teachers and probationers. Through time, it could provide a GME service for other Highland secondary schools. PHS receives a generous allocation from the sum received by THC through the Scottish Government Scheme of Specific Grants for Gaelic Education. It is not easy to extrapolate what exactly that money buys at present and, therefore, what may be available for new developments in GME, but there is no doubt those funds are intended to enable development. In the past, Highland Council responded positively to parental wishes in relation to Gaelic Medium Education. s Languages – Comann nam Pàrant Port Rìgh’s proposal would enable the authority to develop Gaelic education in line with the Guidance on Gaelic Education, deliver commitments in its Gaelic Language Plan and respond to the expectations of inspectors. 2019 should mark long overdue progress in ensuring more young people have the opportunity to be confident, well-educated Gaelic speakers. This article first appeared in the West Highland Free Press. Use native speakers as class assistants to free up teachers. They don’t teach but it’s their spoken Gaidhlig which is a potent reinforcement of verbal skills.! People out here dying to assist.We need to talk too to prevent missing out on changes! Kathryn: i agree especially where teachers are in short supply. See https://www.feisean.org/en/beairteas-b/ and spread the word! Mothers are pivotal in the work of preserving Gaelic. Special effort must be directed to convincing young women of their importance in this essential work to keep Gaelic alive. .